Big F, little f; what begins with f? A flurry of finches fussing over fine filigree. Saint Austin's Pub also has an aviary full of Zebra finches. I realize this is a family pub; so I hope my customers are not offended by this photo of the bathing beauties in their hot tub. Several months ago Mrs Augustine bought me an aviary full of finches. They aren't annoying like parrots. Finches don't want attention like parrots. They are content simply to have fresh water and fresh seed. They don't squawk like parrots; they just chatter. Their conversation reminds me of the song from the Music Man, "Pick-a-little, Talk-a-little" While I might be able to write or talk knowledgeably about various types of beer, ale, porter and stout; and I might be able to discuss the pros and cons of different fountain pens, I don't know anything about finches other than what seems to make them content. Although, like people that isn't always easy to figure out - finches are constantly fussing and fighting with one another. "That's my perch!" "No, that's my perch!" "Get out of my nest!" "Who do you think you are sitting next to my girlfriend?" It goes on like that all day. Fortunately, once the sun goes down they calm down: "do not let the sun go down on your anger" I guess they know their Bible verses. One of the most entertaining things to do when you visit the Pub (we are easily entertained) is take your pint outside and sit in one of the chairs surrounding the aviary and watch the ever busy finches. Bath time is the most entertaining. These finches are drying and preening after morning bath time. At Saint Austin's Pub, we prefer to use fountain pens with heavyweight high quality paper rather than ball-point and roller-ball pens. It isn't that we never use ball-point pens; Mrs Augustine actually gave me a beautifully handcrafted ballpoint pen made out of abalone and brass. The abalone shimmers with multiple colours and the quality of the ball-point cartridge is unusually satisfying. Even so, fountain pens are the writing instrument of choice at the Pub. All four write well and are reliable on their ink flow. However the two best are the Pilot and the Pelikan. These two are always ready to write - they never seem to dry up, even if not used for a couple of weeks. Their points are flexible and very pleasant with which to write and sketch. The Monteverde is probably the most pleasing to the eye but sometimes needs to be primed before it can be used. It is heavy and will start to unscrew apart after much use. The Cross is an elegant work-horse - heavier ink flow than the others and very reliable. You Scots who have the good taste to drink stouts, ales and porters, rather than the wretchedly tasteless American lagers, should likewise put away your Bic Stics; go out and buy a real pen! Hey, if you can have a virtual dartboard, why not a virtual parking lot? 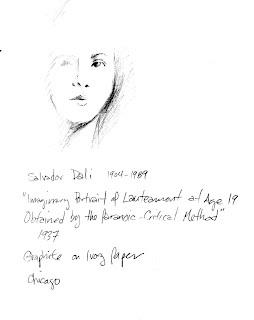 Almost one year ago, I posted a drawing of A Young Girl by Haley and compared it to a drawing by Salvador Dali titled "Imaginary Portrait of Lautreamont at age 19 Obtained by the Paranoic-Critical Method" which is hanging in the Chicago Art Institute. However, at the time I posted "A Young Girl", I could not recall the title of the Dali sketch, so my description and comparison were incomplete. I recently stumbled across this sketch by Vee mack (posted above), which provides that information and a very rough sketch of how the Dali drawing appears - very rough! Dali's sketch is brilliantly and softly rendered in such a way that his pencil work looks much more painterly than any drawing I have ever seen. Dictionary: Surrealism, n. Pure psychic automatism, by which one proposes to express, either verbally, in writing, or by any other manner, the real functioning of thought. Dictation of thought in the absence of all control exercised by reason, outside of all aesthetic and moral preoccupation. Encyclopedia: Surrealism. Philosophy. Surrealism is based on the belief in the superior reality of certain forms of previously neglected associations, in the omnipotence of dream, in the disinterested play of thought. It tends to ruin once and for all other psychic mechanisms and to substitute itself for them in solving all the principal problems of life. The English word "Surrealism" is a mis-translation of the French word "Surréalisme." The correct translation should be "Superrealism." Breton somewhere said that the "surréel is to the réel what the surnaturel is to the naturel." English-speakers say "supernatural". The reason why this matters is that the prefix "surr-" in English is often, not always, associated with the Latin prefix "sub" e.g. surreptitious (Fr. subreptice), surrogate (Fr. subrogé), implying exactly the opposite of the intended meaning. Breton would later qualify the first of these definitions by saying "in the absence of conscious moral or aesthetic self-censorship," and by his admission through subsequent developments, that these definitions were capable of considerable expansion. This excerpt from the above definition sums up the destructive nature of surreal/dada thought: "Dictation of thought in the absence of all control exercised by reason, outside of all aesthetic and moral preoccupation." The call of the surrealist is to pursue a world view that elevates dreams, chaos, deconstruction and self-absorption in opposition to any moral or reasonable "preoccupation". No moral compass. No reliance on reason. The subversion of aesthetics (beauty). What is the natural consequence of such a world view? Imagine such a world as the surrealist propose. Oh, don't imagine it, just watch TV and read the Newspaper. "I could spend my whole life prying loose the secrets of the insane. These people are honest to a fault, and their naiveté has no peer but my own." "We are still living under the reign of logic: this, of course, is what I have been driving at. But in this day and age logical methods are applicable only to solving problems of secondary interest." "Let us not mince words: the marvelous is always beautiful, anything marvelous is beautiful, in fact only the marvelous is beautiful." "Surrealism will usher you into death, which is a secret society. It will glove your hand, burying therein the profound M with which the word Memory begins." "Surrealism does not allow those who devote themselves to it to forsake it whenever they like. There is every reason to believe that it acts on the mind very much as drugs do; like drugs, it creates a certain state of need and can push man to frightful revolts." "In this realm as in any other, I believe in the pure Surrealist joy of the man who, forewarned that all others before him have failed, refuses to admit defeat, sets off from whatever point he chooses, along any other path save a reasonable one, and arrives wherever he can." "It is living and ceasing to live which are imaginary solutions. Existence is elsewhere." "The simplest Surrealist act consists of dashing down into the street, pistol in hand, and firing blindly, as fast as you can pull the trigger, into the crowd." The Surrealist Manifesto was written in 1924. Do you see how artists and philosophers, even from as far back as the 1920s, have influenced the thinking of unwitting teenagers of the present? The last two quotes, in particular, echo the madness of the Columbine shootings. Never fall for the mistaken notion that the ideas of distant philosophers and academics do not eventually appear in the hearts and minds of the common man.